Cold feet? 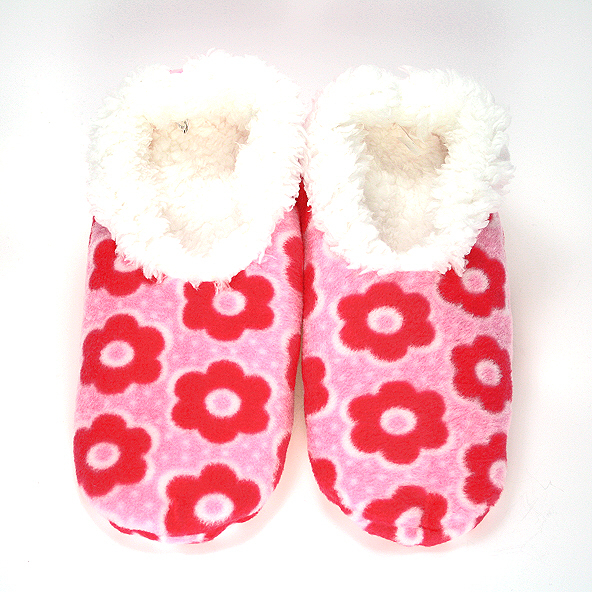 Then these adult Snoozies slipper style slip-ons with a large pink flower head pattern are just for you. Not quite a slipper but much more than a sock, this footwear is snug, beautifully soft, light weight and washable. They have a non slip grip on the bottom and an oh so soft fleece interior. Suitable for young and old they are available in four sizes. Go on, why not treat your feet! They make a great little gift too! Need warm footwear? Then these slipper like footwear with a pastel flowers pattern in blue, pink and orange are just for you. Cold feet? Then these moccasin style slip-ons with a dark pink petal flower pattern are just what you need. Love flowers? Then these slip-ons with a bright orange flower power pattern are just what you are looking for.